Do I have the right to select a shop other than whom my insurance company recommends? Yes, you have the right to choose where your car is repaired. You do not have to use a Direct Repair Shop or even the shop recommended by your insurance company The decision is always yours. Absolutely not. Many of our PDR clients are afraid to get the hail damage on their vehicle repaired because they think their insurance rates will go up. The damage that is incurred by “Acts of God,” such as hail, wind, tornadoes and other damage inflicted by natural disasters, are covered by your comprehensive insurance. Since no one can determine when this type of event is going to occur, insurance companies will not hold these claims against your insurance record. We sure can. We can remove those dents for a lot less than you will be charged for “excessive wear and tear on your vehicle’s exterior.” If your lease is up soon, give us a call; you’ll be glad you did. No, we don’t. There are too many quality problems with the quick, mobile paint repair systems. If your vehicle needs paint work, I’ll be happy to refer you to a quality paint shop in your area. No. The most important factors in determining if a dent can be repaired by Paintless Dent Repair are depth and location. Dents the size of a dinner plate or larger can be fixed successfully, as long as they are not too deep, or twisted. On the other hand, some dents that are as small as a dime, but very deep, cannot be fixed using Paintless Dent Repair because the metal is too stretched. Cracked paint can also be an indication that a dent is too deep. The most common dents fixed are the size of a golf ball and under. About 95% of minor dents can be repaired, leaving about 5% of minor dents that can’t be fixed due to depth or location. PDR Techs has technicians with many years of experience and we can let you know after a visual inspection if a dent can be repaired. Absolutely not. Once a dent has been removed properly with Paintless Dent Repair, it never comes back. Most dents repaired conventionally develop a ring around the dent 3-6 months after the repair, or you can see sand and scratch marks in the repair. This is never the case with properly performed Paintless Dent Repair. 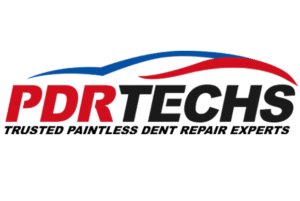 Paintless Dent Repair (PDR), is a method for removing minor dents and dings without compromising the paint from the vehicle. This is done by very patiently massaging the dent out from the back of the panel, or sometimes from the front using specialized tools. The most important benefit is quality. This method is the closest you can get to the dent never happening in the first place. No grinding, bondo, fillers, or primers are needed because your original factory paint is not disturbed. There are no problems with filler or paint shrinkage months after the repair as is typical with most conventional repairs. Cost is also a major benefit of Paintless Dent Repair. A typical estimate for a minor dent from a body shop usually ranges between $350 – $500 or higher. That same dent can usually be repaired for $75 – $150 using Paintless Dent Repair. Time savings is yet another advantage. That same dent can often be fixed in less than an hour. A body shop will take 3 – 5 days, or longer.